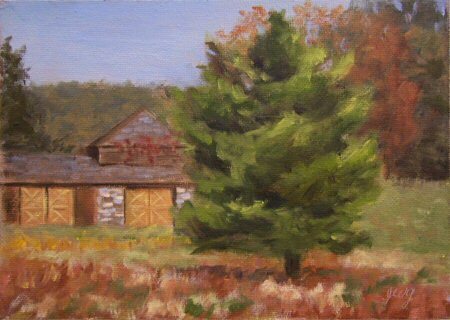 This old stone barn at Ward Pound Ridge Reservation is just loaded with character. It’s a wonderful subject in any season, but of course nothing beats fall! From this spot nestled in the Catskill Mountains, there are gorgeous views from every angle. I can’t wait to go back in different seasons to experience the changes. 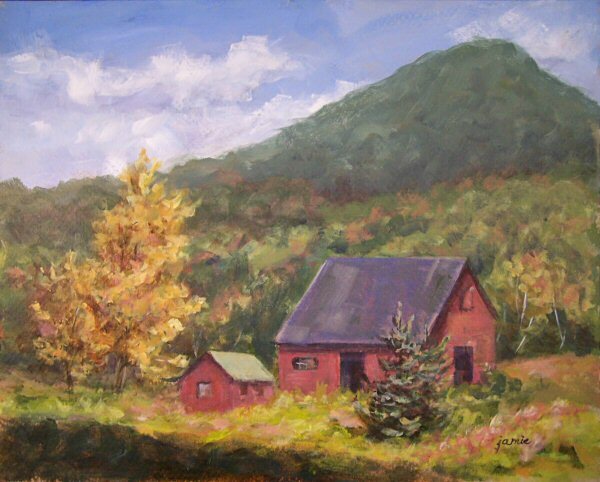 This was painted from a photo I took while vacationing there with my husband, though I have painted here en plein air as well. It’s Watercolor Wednesday again. 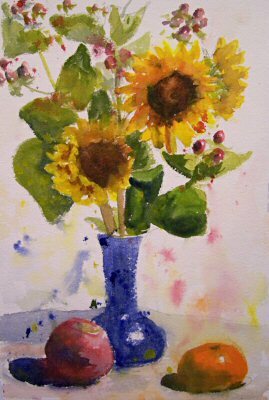 I went out first thing this morning to buy sunflowers. This painting was inspired by Charles Reid, with drips, spatters and sprays. Great fun! 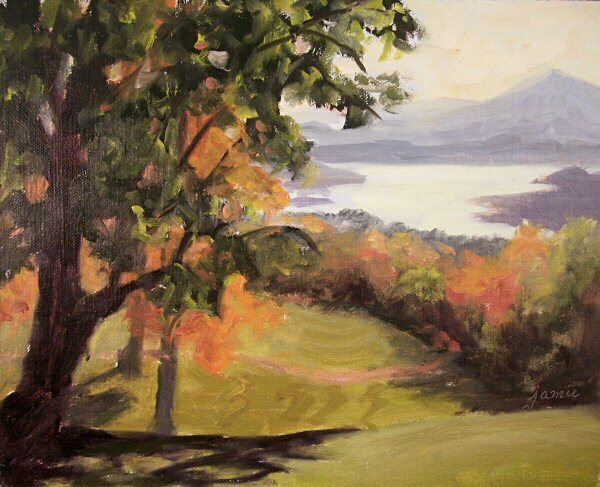 Painted on location at Olana in Hudson, New York. This painting was done en plein air at Olana during the workshop. The palette is just Cadmium Yellow Lemon, Permanent Rose, black and white. 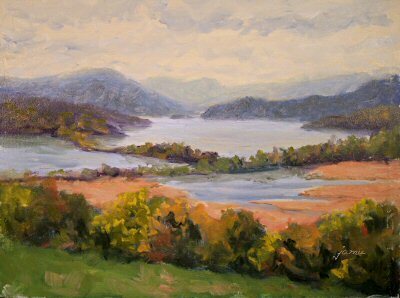 It was an interesting exploration of warm and cool color without a blue on the palette. Results will be posted next Sunday. Many thanks to those of you who voted. I’m not surprised by the results, as I also love looking at other artists’ sites! Poll results will remain on the right sidebar, and as more accumulate, I may move them below the gallery listings. This is the back yard and cottage of the place where I’m staying. Fall foliage is in full swing here, and I’m painting up a storm! I didn’t have a chance to do a watercolor today, so it looks like Watercolor Wednesdays will have to resume next week. 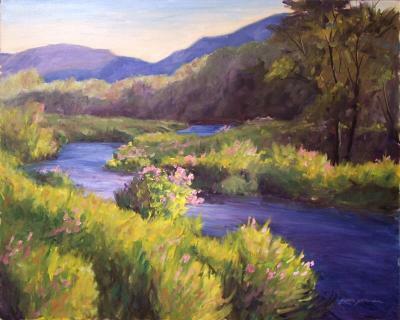 At the workshop today, Kenn spoke about hard and soft edges and did a beautiful painting demonstrating the topic. Then it was our turn to try our hand. It was freezing cold outside and raining on and off. Sometimes on those overcast days, the skies can be grey and dreary, but today there was lots of variation and color in the sky as the rains came and went from west to east. I had my painting umbrella, so I fared better than most. 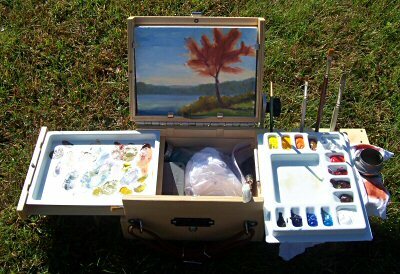 I don’t have my light box setup here to photograph my paintings. The lighter clouds are much warmer in color. I’ll get a better photo once I get home and will then swap the images. 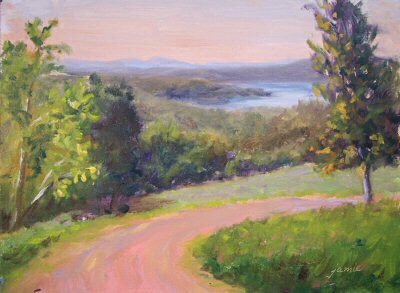 I’m up in the Catskill Mountains of New York State taking a wonderful week-long workshop with fabulous plein air painter Kenn Backhaus. Today he discussed block-ins. 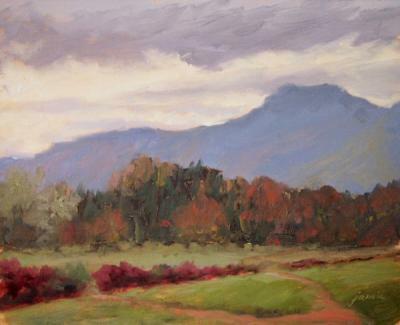 He did a color mixing demo and a painting demo in the morning, and then we did a couple of block-ins in the afternoon. Although these are not meant to be finished paintings, I might finish them up from photos once I get home. These are both just 8×6″, and were done with my little Guerrilla Painter “thumbox” in oils, on sealed, primed hardboard panels. 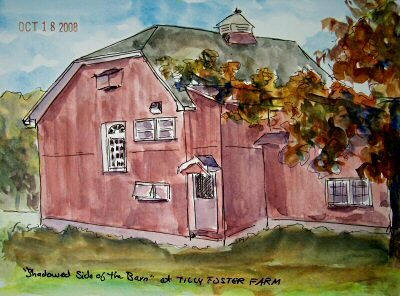 My daughter and her friend had a photography class today, so while they were in class I pulled out my sketchbook in a shady spot and did a “Saturday Sketch” at Tilly Foster Farm. I struggle with architecture, so it’s always a great challenge for me when I’m out sketching. 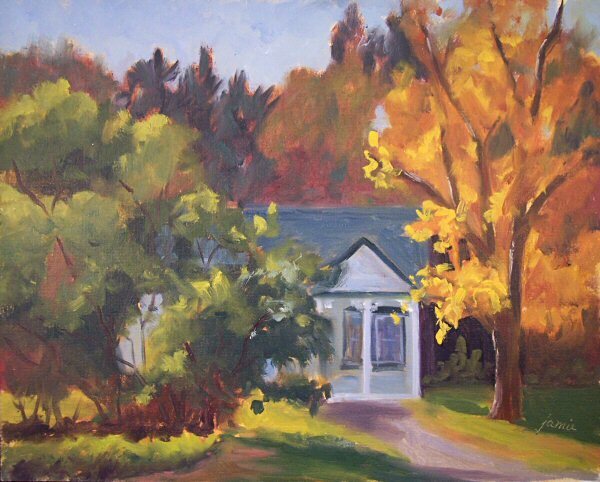 This was painted yesterday at Boscobel Restoration in Garrison, New York, when the sun finally emerged from the heavy cloud cover as promised. 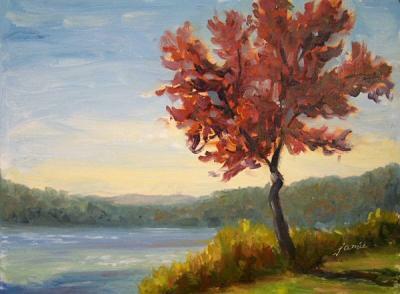 The light shimmered on the Hudson River, and the backlighting on the red tree made it glow like Christmas bulbs. I know this looks like some kind of strange abstract in its infant stages, but stay tuned! 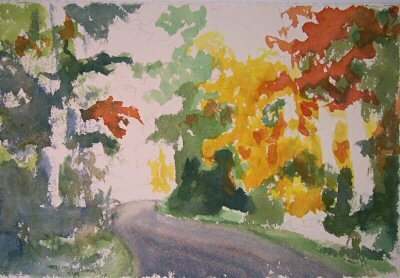 Watercolor Wednesday will continue on Thursday this week, and I’ll post the finished painting tomorrow. Finished painting can be seen by clicking here. 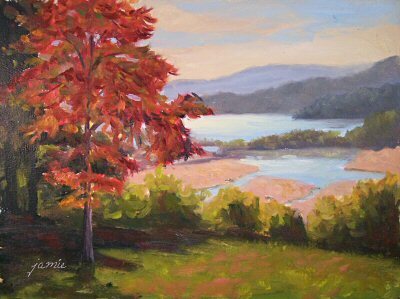 Although I go to Boscobel several times every year in fall, I never get tired of painting Constitution Marsh as it turns from the greens of summer to the blazing colors of fall. The Hudson River was shimmering brightly this morning despite the clouds, as if the sun somehow sought out the river in spite of the overcast skies. 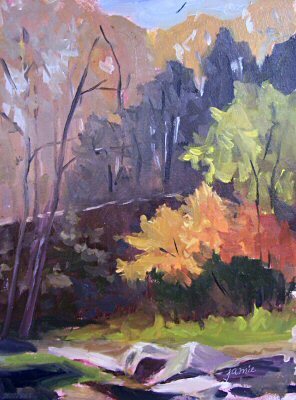 It was another fabulous fall day to be out painting. This is my favorite tree along the lakeshore here. 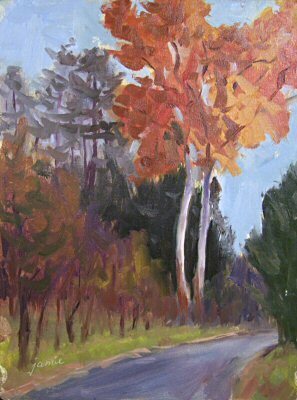 It turns this bright crimson color in fall, and I love the twists and turns of the trunk. It’s Watercolor Wednesday again! I still have Hudson River School images of Olana running through my mind, so I pulled out the photos I took while painting there the other day and did this one from my pictures. I worked on Cold Press paper this time. $165.00 plus $10 shipping and insurance within the Continental United States. For local sales, shipping charge will be allocated to NYS Sales Tax. Please email me at JamieWG@aol.com for International purchases or with any questions. 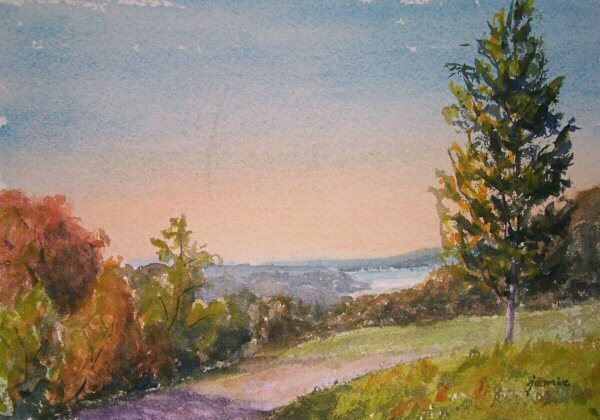 When the haze lifted, the view of the Hudson River suddenly appeared in the distance! It was raining pretty heavily at 6:30am and I wondered if I should go up to the beautiful home of Hudson River School artist Frederic Church for the day. I finally decided to take the chance, and drove up to Olana. It was heavily overcast when I got there, but the rain had ended. 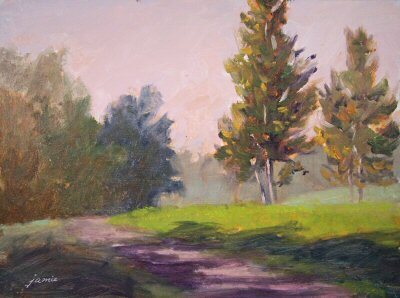 I set up my easel along this path winding down through the fields, where I enjoyed the serenity, atmospheric light, and fading distances. 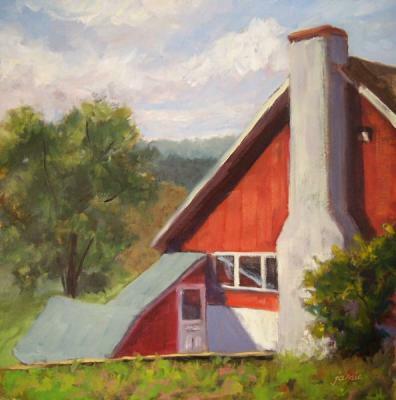 I love this spot in the Catskills with the little red barns. I’ve been doing a bunch of compositional and color studies to select a composition for a large painting of the scene. This is the third one I’ve done. 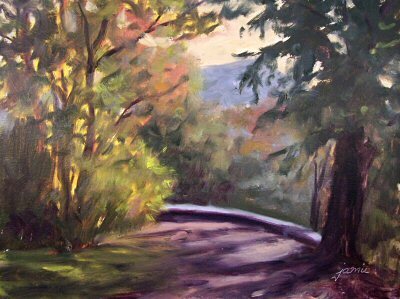 It was painted mostly on location, and touched up a bit in the studio. 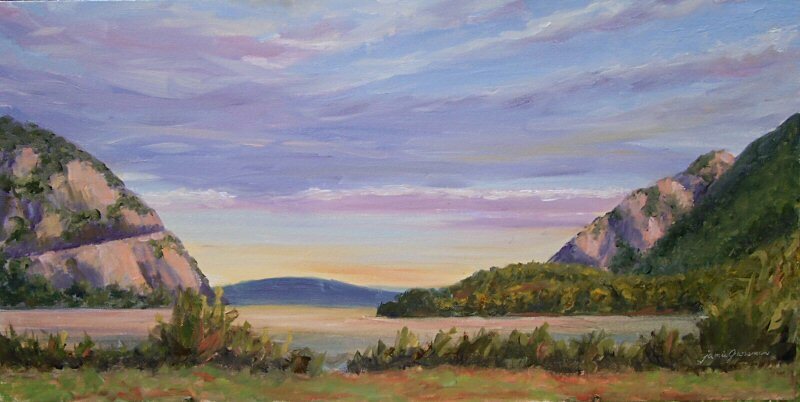 This painting was done this morning at sunrise at Cold Spring waterfront park along the Hudson River. It was sooooo cold. Brrrrrr!!!! Storm King mountain was initially shrouded in fluffy pink clouds. It was an awesome sight, but the clouds had risen by the time I was set up to paint. FREE SHIPPING special on this piece for limited time only! 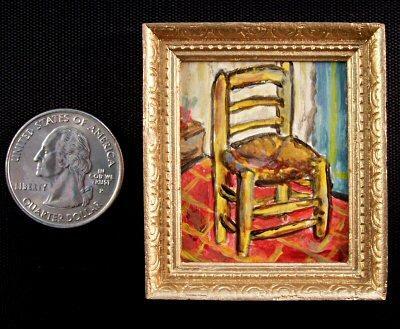 This painting is a copy of the famous painting, Van Gogh’s Chair. The chair was a symbol of stability in his world of continual crisis. He painted this in December of 1888 through January 1889. 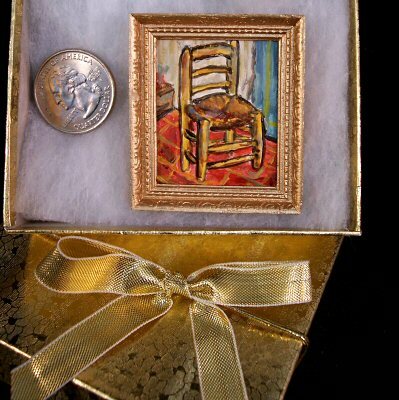 I love doing these tiny copies, as it makes me closely examine paintings that I so admire in terms of their composition, rendering style, and color harmonies. 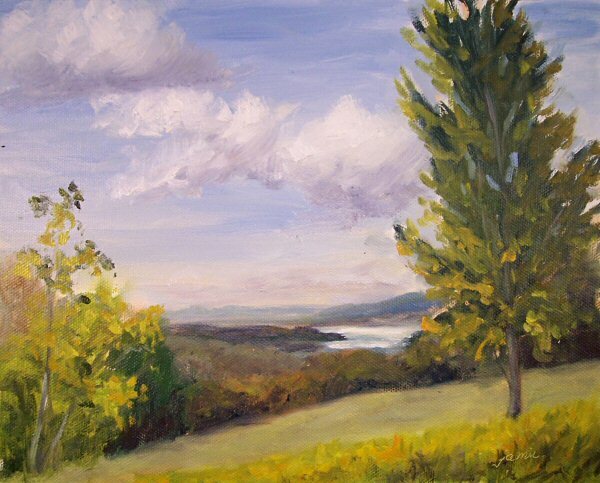 This painting was started on dull, dreary, rainy Sunday. It was lifeless and boring, so I went back to Tilly Foster Farm this morning when the sun was shining to “turn on the lights”. I like it much better now as a happy day painting!